U.S. President Barack Obama speaks about U.S.-Laos relations at the Lao National Cultural Hall in Vientiane, Sept. 6, 2016. President Obama on Tuesday said the United States “has a moral obligation to help Laos heal” as he pledged $90 million over the next three years to help clear the county of unexploded bombs the U.S dropped on the country during the Vietnam War. 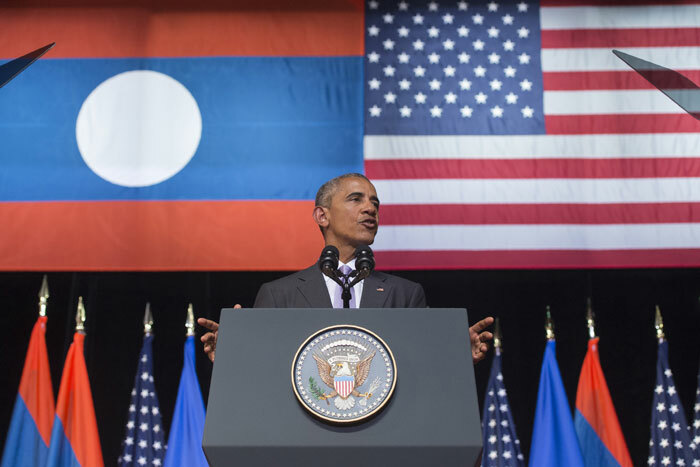 “Given our history here, the U.S .has a moral obligation to help Laos heal,” Obama told about 1,000 people at the Lao National Cultural Hall in the capital of Vientiane. The U.S. dropped hundreds of tons of bombs on Laos during the war, but one-third of those failed to explode, and 20,000 people have been killed or injured by unexploded ordinance (UXO) in Laos since the bombing ended, according to the organization Legacies of War. The U.S. has already contributed $100 million to the effort over the last 20 years, and annual deaths from the explosions have fallen from more than 300 to fewer than 50, the White House said. While Obama said too few Americans know of the United States' covert bombing of Laos during the Vietnam War, he offered no apologies for the bombing itself. Obama’s commitment was embraced by at least one victim of unexploded ordinance, who told RFA’s Lao Service that the war now seems like it belongs to a different era. “You ask me if I still hate Americans. Let me answer you frankly. I never think of hate, because hate belongs to that era,” said the victim, who requested anonymity. Despite the lack of apology, the bomb victim said he hopes his nation and the United States can now move forward, and that Obama will press the Lao government to allow more freedom inside his country. The president arrived in Laos late Monday after attending the Group of 20 summit in Hangzhou, China, for a series of meetings this week focusing on security, terrorism, natural disasters, and other regional issues. Laos is this year’s chair of the Association of Southeast Asian Nations and is hosting the ASEAN summit in Vientiane. Reported and translated by RFA's Lao Service. Written in English by Brooks Boliek. Mars will have family in Laos forever but the land. Laos Great Land Give Away will come knocking. With that $90,000,000 you will see more Lexus and Range Rovers on the road driven by government officials. Yeah, there's no hate but those that supported the current Lao gov't during the war. Live with it!! You fought and died for the current Lao gov't system! Stop asking your past enemy to give what you fought to not accept, FREEDOM! Yes, more freedom to those that deserve it and fought for it! They are still prosecuted by the gov't in Laos!! Returning question for Anon. I am Australian and currently live in AUS with land and family 30mins from Mukdahan and the lower Friendship Bridge over the Mekong to Lao. I would like to have a friendly talk. Share some knowledge.